We have all known for over a decade that this was coming. Well…now it’s here. Major League Baseball’s all-time saves leader, future Hall of Famer and one of the greatest Padres in franchise history (both on and off the field) decided to hang ’em up following the 2010 season. 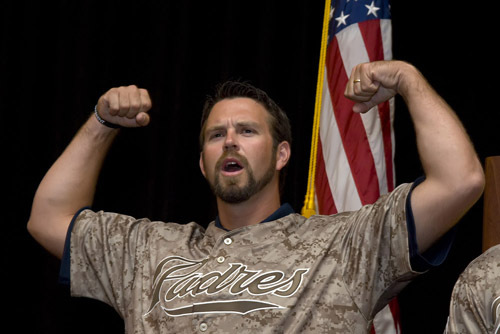 On August 21, the Padres will pay tribute to Hoffy with a postgame ceremony. As part of the celebration, the club has plans to retire his iconic #51. The Pads did it again, winning 5-4 over the Braves last night and extending their winning streak to a season-high four games. Each of the four wins have come by one run (2-1, 5-4, 3-2, 5-4). It is the longest winning streak for the club since taking five straight 8/15-19/10. Also of note, Mat Latos picked up another win with 6.0 innings of two-run ball last night. He has won two straight and three of his last four, lowering his ERA to 3.97 on the year. Ryan Ludwick continues to pound the ball, collecting four hits last night. He is 9-for-14 over his last three games and finished the month of May hitting .314. Jason Bartlett’s streak of nine consecutive games with an RBI came to an end last night (although his hitting streak ran to 10 games and counting), meaning he tied the club record for consecutive games driving in a run. Bartlett tied streaks by both Sixto Lezcano in 1982 (April 16-27) and Steve Finley in 1996 (June 22-July 1). Also of note is the fact that Bartlett’s streak did not include one home run. According to the Elias Sports Bureau, over the last 65 years only one other player had an RBI in nine consecutive games without hitting a home run: Kirby Puckett had a 10-game streak for the Twins in September 1988.